The single action 1873 is a timeless handgun and a symbol of the American west. The Chiappa SAA 1873 series captures the spirit and allure of these fine revolvers. 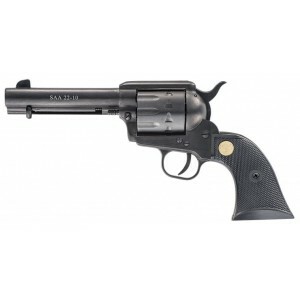 Chambered in easy to shoot, readily accessible rimfire cartridges the SAA 1873 is an excellent single action revolver. Available in different barrel lengths, finishes and cartridges, these are perfect for plinking, target practicing and even small game hunting. Models with dual cylinders are available to change back and forth between .22lr and .22WMR. The SAA 1873 is even available in the popular .17HMR!